Booby-Trapped Letter Injures IMF Employee In Paris : The Two-Way An executive assistant suffered minor burns after a letter exploded at the International Monetary Fund's office in Paris on Thursday. 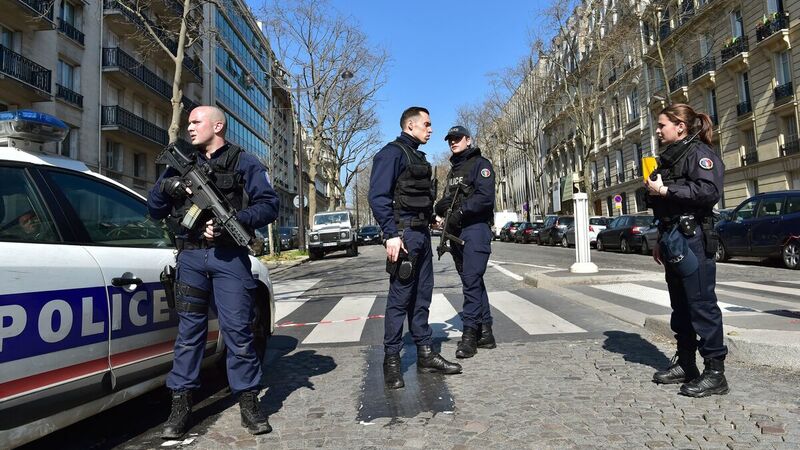 French police officers secure the scene near the Paris offices of the International Monetary Fund on Thursday, following reports that a letter bomb had exploded at the premises. An executive assistant suffered minor burns after opening a letter that exploded at the International Monetary Fund's office in Paris on Thursday, according to multiple local news reports citing police statements. The device doesn't seem to have been very powerful — but French officials say it was an act of terrorism. "It seems to be a pyrotechnic device or a big firecracker," the Paris police prefect, Michel Cadot, said, according to Le Monde. "It's something relatively artisanal, it's nothing like a bomb." Police say there hasn't been a claim of responsibility. "We are facing an attack, there is no other word after facing a parcel bomb," said President François Hollande, in comments relayed by Le Parisien. "We must search for all the causes and find those responsible. We will do it with stubbornness, perseverance and to the end." "I was informed of the explosion at the IMF office in Paris which injured one of our employees. I have been in touch with the office and my compassion goes to our colleagues there. I condemn this act of cowardly violence and reaffirm the IMF's resolution to follow through on its its work to ensure its mandate."